• The only spray chrome chemicals guaranteed not to turn yellow from the sun. • OEM quality adhesion due to advance plasma technology. • Long lasting and economical. 90 day pot life once mixed. Not 24 hours! • Easy to apply top coat. No champagne bubbles. • Tolerates much higher temperatures. 350ºF/174ºC. Coat parts under the car hood without discoloring and fogging. •Touchable base coat. Just wipe off accidental fingerprints with distilled water. •Our Base Coat can be cut and buffed if you like. Many of our customers started out with one of the competing spray chrome systems. They were disappointed in the results and switched to Cosmichrome chemicals. they were frustrated by rude tech support if there was any at all, parts turning yellow, peeling fogging, and hard to spray base coat and top coat. We can help you too. Our spray chrome coatings are even being adopted by the vacuum coating industry because of their durability, adhesion, reliability and beauty. The paints are easy to apply without orange peel. Our chemicals are long lasting to save you money and they are much easier to spray. Our technology produces a much more beautiful coating than any other spray on chrome system and it is much more durable. Our top coat is easy to apply. Just apply two medium wet coats. That's it! Best of all it never discolors from sun exposure and it sticks to the metal like glue. Covers Apx. 470 sq. ft. Covers Apx.1400 sq. ft. Covers Apx. 2800 sq. ft. Covers Apx. 5600 sq. ft.
Base Coat Easy to apply. Lays flat and glossy. Fast drying. Can't be over dried. Touchable, Fingerprints wipe off easily. Cut and Buff if you like. Activator A22 Concentrate Mix with distilled water. Ready to use in 5 minutes. G5 Ready to use. No mixing! Last 90 days after opening. Eliminates expensive wasting of leftover chemicals every day. G4/G4-11 Combine these two and then they last 90 days. Eliminates expensive wasting of leftover chemicals every day. A Cosmichrome exclusive. Speeds up the blow drying process. Protects the metal while waiting for top coat from oxidation and stains from accidental splashes and drips. Top Coat Chrome Remarkable clarity. Easy to apply. Pre tinted for matching chrome color. Fast drying. Durable. Flexible. Doesn't produce "champagne bubbles"
Top Coat Clear Use this top coat for adding dyes to produce colored chrome and simulated metals such as gold, brass, copper and bronze. Other spray chrome systems are plagued with yellowing and discoloring of completed parts. Cosmichrome's patented process will not turn yellow. Guaranteed. Cosmichrome's mixed plating chemicals last 90 days. Chemicals from our competitors expire at the end of the day and any leftover chemicals can't be used the next day. Cosmichrome chemicals eliminate this expensive waste of materials. Cosmichrome base coat can't be over dried. Competing chemicals lose adhesion if the base coat dries to long and look foggy if the base coat isn't dry enough. You can let Cosmichrome base coat dry all weekend or accidentally bake it too long and there is no harm or loss of intra-coating adhesion. In fact the dryer our base coat the better the adhesion and shine. Our top coat is simple to apply. Two medium wet coats and you are done. Competing systems are plagued with what they call "champagne bubbles". Champagne may sound nice but it will give you horrible headaches. You are forced to apply layer after layer of dry coats of an untinted top coat to prevent bubbles before you can apply a wet coat of a chrome tinted top coat. Then after all that work, your part eventually turns yellow. The yellowing may happen in a few weeks or a few months but it will happen even if the parts are never taken out doors. It's embarrassing and it will make your customers angry. You can do the part over but it will happen again. Cosmichrome top coat will not turn yellow. During practice for the 2013 Indy 500 a car coated with a competing spray chrome product had a total adhesion failure. All their chrome peeled off in a big cloud of what looked like glitter. 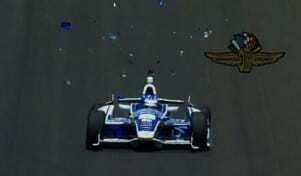 As far as we know it was the first time in history a car was back flagged at the Indy 500 for peeling paint. Cosmichrome has been part of the livery on every Andretti Autosport Indycar in every race since 2009 and has never had an adhesion failure. Can your Spray Chrome Do This? Try applying tape to the bare metal layer on your spray chrome. Does the tape lift off the metal? If it does then you will have very poor adhesion once you apply your top coat. Your adhesion will only be temporary. When your coating cures it will peel apart like the Indy Car coated with a well know competing product in the photo above. Cosmichrome adhesion is so good that tape will not lift the bare metal off the base coat. Then our non yellowing top coat will bind to the metal layer and form a durable bond. How Long Is Your Chrome's Pot Life? If you use Cosmichrome, your metal plating chemicals last 90 days after mixing. With competing systems all the chemicals expire at the end of the day and leftover mixture is wasted and has to be discarded. 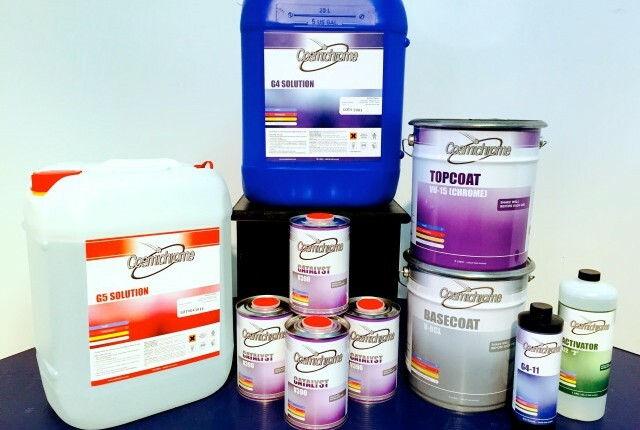 Cosmichrome's long lasting chemicals eliminate this expensive waste of materials. Our chemicals are also much easier to mix. Just add one bottle of concentrate to the blue jug (G4) and you are done. The other chemical (G5) is already mixed. This prevents mixing mistakes and accidental contamination of the plating chemicals, a common source of waste and frustration.